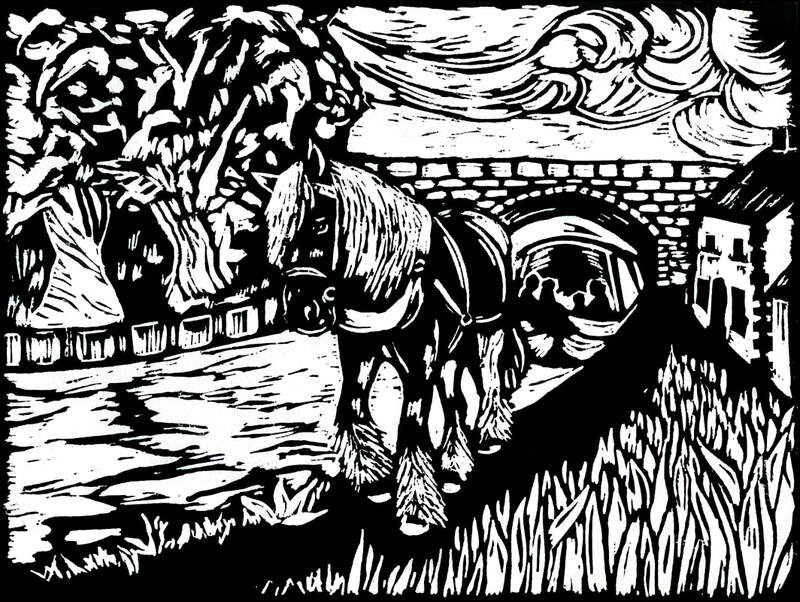 A series of linocut prints describing a seven day narrow boat journey along the Ellesmere Canal (also know as the Llangollen and Shropshire Union Canal). From Trevor Basin to Grindley Brook and back again, with overnights in Chirk, Ellesmere, Grindley Brook Locks, Bettisfield, Llangollen and Trevor. The journey took place in May during a week of glorious sun shine, hawthorn and lilac blossom. Our journey begins a few miles upstream from Llangollen at Horseshoe Falls. Here a wide yet shallow weir has been built into the River Dee. The purpose of the falls is to divert waters from the Dee into the Ellesmere Canal system which we will later journey along. The feeder canal and falls are inaccessible to engine powered narrow boats, being too narrow and shallow for these vessels. But such is the historical and aesthetic significance of the site it merits a D-tour by car and on foot. Horseshoe Falls was designed in 1808 by the canal engineer Thomas Telford. Set snugly in a quiet Welsh valley, lush meadows sweep gently down to the rivers edge. Stately beech and oak trees, artfully planted, enhance the scene. The crystal clear waters quietly churn and gurgle over the crescent shaped falls. Beneath the warm spring sunshine we spread ourselves out on a carpet of buttercups, happily passing time in this idyllic setting. No matter where I am or where I travel, even on water, I will befriend a horse. In the town of Llangollen I found this horse, Dakota. A four year old skewbald cob. I have a particular affection for horses that do a days work and Dakota does just that, pulling a tourist barge along the Ellesmere feeder canal. It is his first year as a working horse and though he is still in training he is a very obliging and willing beast. Bribery in the form of sliced apples keeps him keen. About twenty of us board the James Brindley, a flat bottomed, open topped narrow boat. The crew casts off and we wait for Dakota to lean into his harness and take up the slack on the lead line. Gliding away from our moorings on the Old Llangollen Wharf we accelerate at a surprising pace. It is an entirely different experience to traveling on a motorised narrow boat. The silence is total, no need here to shout above a noisy diesel engine. The motion feels different too, on a diesel powered boat you can feel the engines vibration throughout, on a horse drawn boat there is a curious feeling of weightlessness. Dakota strides up the towpath towards Horseshoe Falls. After a journey of about two miles it is time to return to base. As it is not possible to turn the boat in such a narrow channel the tour operators have come up with a clever solution. The James Brindley is the same shape at both ends, so either end can operate as the stern or the bow. A portable tiller and rudder is unclipped from the stern and repositioned at the bow. Dakota is turned round 180 degrees, his lead line reattached to what was originally the stern and our return journey begins. Gliding effortlessly along, the rhythmic clip clopping of the Dakota's massive hooves makes for an extremely relaxing and absorbing experience. At Trevor Basin we take possession of Wensleydale, a 50-foot steel hulled narrow boat for hire. Bunks are claimed and counter claimed, the head inspected and important rations such as; pies, cheese, beer and biscuits are stowed in the galley. After a quick celebratory pint and cheese sandwich in the nearby Telford Arms, we cast off. No sooner have we gunned the engine our bow noses out onto the Pontcysyllte Aqueduct. This steel tough which carries the Ellesmere Canal across a deep valley, over the River Dee, is also know as the Stream in the Sky. A world heritage site, it is the highest navigable aqueduct in the world and another of Thomas Telford's engineering triumphs (William Jessop also claims some credit too). The passage is so narrow, there is roughly three inches to spare on either side of our boats gunnels, single file traffic only here. In peak season there are long queues of boats waiting their turn to make the crossing. We progress across the dizzying abyss at a snails pace. The drop beneath and beside us is vertiginous. Adrenalin is not something I would ever have associated with the sedate practice of narrow boating. But crossing the Stream in the Sky my senses are on high alert and it takes a while for my pulse rate to stabilise. 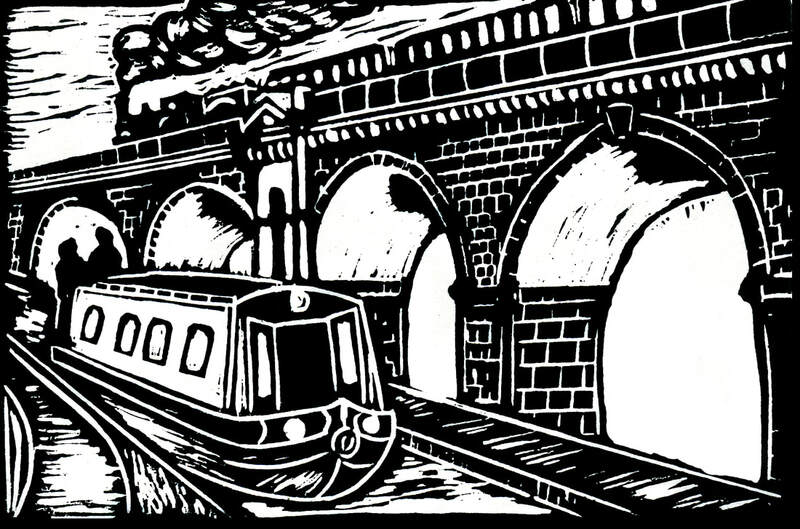 I really struggled with this linocut of Chirk Aqueduct. Working with so many lines of perspective on such a small scale was painful. I'm not very happy with the piece, but I won't be redoing it! The juxtaposition of the aqueduct against the towering railway bridge really interested me. The construction of railways marked the beginning of the end for canals as a means of transporting goods and people around the country. A horse drawn narrow boats only average around four miles per hour and was quickly eclipsed by powerful steam locomotives. At seventy feet high this aqueduct passes over the River Ceiriog and is the bridge between England and Wales. Both monuments are still in use today. In a romantic gesture I etched in a seam train crossing the bridge above us. Leaving Chirk the landscape changes, the valleys and dales of Wales are replaced by rolling, fertile meadows of Shropshire county. We moored Wensleydale at Frankton Junction, where the Ellesmere and Montgomery Canals intersect. A short walk brought us to pretty flight of locks know as Frankton. The lock keeper here holds the 'Lock Keeper of the Year' award and it is a well deserved accolade. There are several flower beds planted with a variety of herbs which passersby are encouraged to pick and eat. The view in this print is from Old Canal Tavern looking back at the staircase and the toll office. A wall mounted plaque at the middle lock informs us that the famous narrow boat Cressy was brought here and dry docked while being converted from a work boat to one of leisure. Cressy was bought by Tom Rolt 1939 and together they journeyed the canal network in the early 1940's. His book Narrow Boat details their adventures and is the inspiration for our own canal adventures. Rolt later went on to co-found the Inland Waterways Association, an organisation which campaigned to save several canals in the British midlands from closure. From Frankton we continue our canal journey to Ellesmere were we moor for the night. I did a double take when I first saw this duck. Its' colouring and plumage is so utterly exotic. It hardly seemed real as it flashed by, lost in the wash of our propeller wake. Luckily I was able to grab a hasty and blurry photo of it. 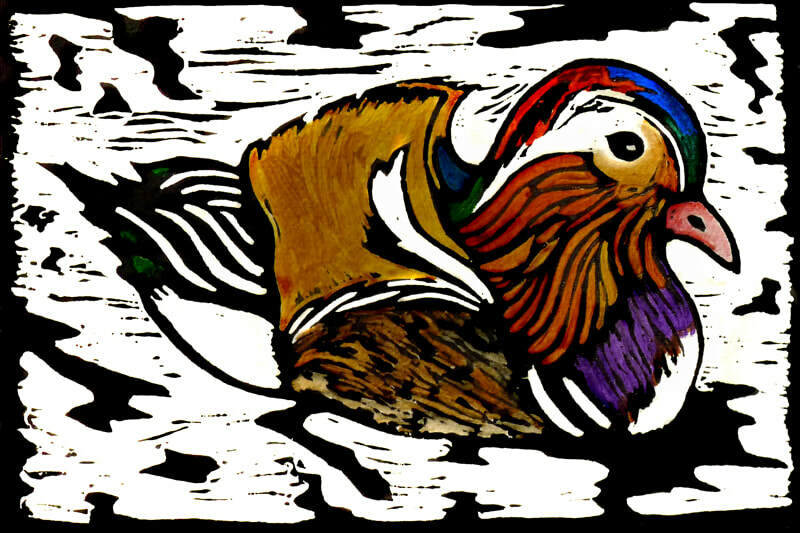 Later that evening some internet research revealed the birds identity, a Mandarin duck. Not a native species to the UK, Asian origins, but now a permanent resident. The Ellesmere Canal is a fabulous habitat for birds, especially around its meres (lakes) and mosses (marsh). One nights mooring stands out in particular, a sheltered embankment between Hampton Bank and Bettisfield was the perfect hide to look out over Balmer Heath and watch its many residents; lapwings, Canada geese, swans, buzzards, coots and hares. With only one pair of binoculars between three people we jostled for close-up views late into the fading evening light.